Alfred Edward Housman (1859–1936) made it a principle never to refuse permission for poems from A Shropshire Lad to be set to music. ‘I always give my consent to all composers in the hope of becoming immortal somehow’, he once quipped. This wasn’t to say he couldn’t breathe fire when liberties were taken with texts—he was reportedly cut to the quick when he observed that Vaughan Williams had omitted two verses from Is my team ploughing? in his setting for the On Wenlock Edge cycle. ‘I wonder how he would like me to cut two bars out of his music’, was the wounded retort. What Housman made of the idea that John Ireland should actually start his setting of March (as ‘The Heart’s Desire’) at the third stanza hardly bears thinking about. ‘Neither illustrators nor composers care twopence about words and generally do not understand them’, was the poet’s perhaps uncharitable declaration on the whole subject. In any case, maybe in part because his own sympathies lay with the popular music of his day, Housman found listening to settings of his words painful and embarrassing. The story goes that having said as much to Herbert Howells over dinner one evening, the composer promptly destroyed his own Housman songs. May that yet prove to be one of HH’s familiar false trails and the songs turn up in some unconsidered brown-paper parcel. Housman was certainly kept busy granting his permissions. The songs on these two CDs represent no more than a fraction of those available. By one count, in the poet’s time or later, there have been, for example, ten settings of Loveliest of trees; eight of When I was one-and-twenty; seven of In summertime on Bredon; six of White in the moon the long road lies. Another source suggests that world-wide the number of song cycles based on A Shropshire Lad currently tops 160. And for as long as composers have been ensnared by the verse, so have writers been rehearsing and re-rehearsing the reasons why A Shropshire Lad should have ‘cried out for music’, in Ernest Newman’s phrase. Clearly, like the similarly much-quarried German poet Heine and Shakespeare (acknowledged as prime influences by Housman himself) the lines are open, lyrical and rhythmic, transparent in quality and yet loaded with meaning and emotion that peel off in layers. Simple language becomes luminous. The feel of the language of folk-song has chimed with modern times—especially around the turn of the century, when many composers were acutely aware both of its potential as the cellular material for a ‘national music’ and, of course, of its vulnerability in a rapidly urbanising age. Allied to that is the attraction to composers of the similarly vulnerable English pastoral scene which lies behind A Shropshire Lad. And so one could go on, not least to the appeal of specific themes to specific composers. But A Shropshire Lad’s allure cannot have lain exclusively in its ‘musical’ qualities. George Orwell once said that Housman ‘had the deepest hold upon the thinking young’ from 1910 to 1925, his poetry reflecting such root issues as the questioning of religious truth and the value of human life in an age of modern warfare—subject matter enough to stir a composer. The main potential drawback of A Shropshire Lad as far as composers are concerned has to do with the straightforward, ‘naive’ metres—part of the poetry’s essential quality, of course, yet too predictable for many a serious-minded composer with aesthetic scruples to burn. Hence, for example, the spreading of Butterworth’s setting of Look not in my eyes into a basic flow of 5/4; the off-the-beat entries of Orr’s When I watch the living meet; or the slinking in and out of 3/4, 4/4 and 5/4 of Barber’s With rue my heart is laden which threatens a mild sea-sickness. Not of course that the basic rhythms can’t serve perfectly well where metric simplicity, in context, can be exploited as a virtue—there’s music in them, after all. Given the extraordinary interest composers have shown in A Shropshire Lad, not to mention its huge popularity with the general public (never out of print since it first appeared in 1896), it comes as a surprise that the slim, unassuming volume was not the immediate success that commentators have sometimes accorded to it. When Housman once read such an assertion from an author, he wrote in the margin of the page in question, ‘It wasn’t’. The poet himself paid the then considerable sum of £30 towards the book’s initial publication in 500 copies by Kegan Paul, and then looked on as sales crept only to 494 by the end of 1898. Even after the ambitious young journalist Grant Richards took A Shropshire Lad onto his initial list as a publisher and pushed it hard, only 1,475 copies had been sold seven years after its release. Having apparently then reached a critical mass, sales multiplied from 1906 (with Boer War memories still potent enough to vibrate sympathetically with so much of the poetry) to 1911, averaging 13,500 a year. During the Great War, A Shropshire Lad was in the kitbag of many a Tommy—Housman insisted on keeping the price low to accommodate them. Housman was deeply proud of A Shropshire Lad but remained a passive spectator of the sales charts. He never took a royalty. Clearly the poems had meaning for him far beyond fame or material gain. Although he had written poetry for some considerable time previously, the key year for A Shropshire Lad is 1894, when the idea finally evolved of extending a selection of his existing poems into some form of cycle which would reflect both his personal philosophy and his sense of geographical dislocation—born and brought up in the West Country before moves to Oxford and then London. The scene change is first reflected in A Shropshire Lad at White in the moon and As through the wild green hills of Wyre, although essentially Housman merely takes up a new viewpoint, London, from which to scan the same ‘territory’. By this time he was Professor of Latin at University College, London, having surmounted through sheer force of academic brilliance the obstacle created by inexplicable failure in his final examinations at Oxford. His sister Kate believed the significant emotional release which opened the way to the rapid completion of A Shropshire Lad was the death of their father Edward Housman in November 1894—he and his oldest son not having been exactly at ease with each other. That the poems were deeply personal in nature could be guessed from the original intention to publish pseudonymously under the title The poems of Terence Hearsay—a smoke-screen to readers, a smoke-screen to himself, under cover of which he could perhaps feel more secure to explore his innermost thoughts and feelings. His brother Laurence—a literary man himself—guessed as much. The replacement title is maybe still a hint at the diversionary tactics going on. As the Housman scholar Keith Jebb, for one, has suggested, Shropshire is here more an idealised stage for an idealised vision of rural life, onto and into which the harsh realities of Housman’s life philosophies are placed. For one thing, Shropshire’s boundaries would have to be redrawn to include for certain all the West Country references in A Shropshire Lad. Although he came to know Shropshire well, the formative memory of the county was as distant views seen on childhood walks from the family home at Fockbury in Worcestershire. Shropshire, he was to recall, was on ‘our Western horizon which made me feel romantic about it’. A short distance then to the county’s becoming the idealised ‘Land of Lost Content’, a ‘safe’ location in which to place baggage too deeply personal to be coped with adequately in everyday life. A Shropshire Lad, some have said, should thus be seen more as an outlet for Housman’s emotions rather than an expression of them. At the risk of analysing only selected layers of a complex psyche, three areas at least stand out with blatant clarity in the poetry. First, the stone-cold, crushing fatalism, nihilism, the dwelling on the transience of life—call it what you will—seen in any number of lines of such ilk as ‘Wonder ’tis how little mirth | Keeps the bones of man from lying | On the bed of earth’ from Twice a week the winter thorough. Housman’s atheism is reckoned as a response to the death of his mother when he was just short of the age of twelve—although the final renunciation of his religious faith came during student years at Oxford. His brother Laurence felt he may have clung on to some vague belief in a Supreme Being, but not one of a personal nature. The very starkness of the fatalism seen in A Shropshire Lad, warmed only by nostalgia, hints at its having an emotional basis rather than being purely an intellectual construct. Ironically, however, easily the greatest number of literary allusions made in A Shropshire Lad are to the Bible—although, to be fair, Matthew Arnold does come in a close third (behind Shakespeare). Then, it takes no great genius to detect within A Shropshire Lad the pain and regrets of someone unlucky in love. What only a few could have guessed at was that this was rooted in Housman’s repressed homosexuality. The awareness of such leanings left him with the inevitable sense of being an outsider in the society of his day, additionally guilt-ridden out of respect for his mother’s religion, and with the further hurt of his ultimately unrequited (it seems) love for Moses Jackson. The two met as students at Oxford and shared lodgings—along with Jackson’s brother Adalbert—for three years in London. The relationship with Moses, a brilliant scientist and athlete who became a fellow of University College, London, first cooled and then was all but severed when Jackson first left for India and then popped back to marry and whisk off a young widow, Rosa Chambers. Housman wasn’t invited to the wedding in December 1889—was even, significantly, kept in the dark about it. A Shropshire Lad’s outlook on love is inevitably coloured by all of this, committed to paper even as a homophobic society was pouring scorn and hatred on Oscar Wilde over the notorious 1895 trial which saw him sentenced to two years’ hard labour for homosexual practices. The inclusion by Anthony Rolfe Johnson and Graham Johnson in the present recording of the two Berkeley settings, despite their texts coming from outside A Shropshire Lad, has been made more readily to highlight this side of Housman’s psyche—the verses mourning the ‘loss’ of Moses Jackson. But there is so much else to be read into this deceptively ‘straightforward’ poetry—the sense of history, classical allusion, the special feeling for youth and the young—some of it retrieved with relative ease, some surrendering only to greater familiarity. Given the nagging pain and doubt that underlies so much of the verse, one can only hope that the vision of ‘Shropshire’ itself—the earth, as in Mahler’s Das Lied von der Erde—offered some form of consolation. Housman, a friend once recalled, had ‘a deep appreciation of the beauties of nature, as regards landscape, & the wild flowers, birds and animals which one comes across in the course of a long day’s walk over fields, & commons & through woods’. The Great War did not produce the first full flowering of George Butterworth the composer (1885–1916) in the way that it was the making of the poet Wilfred Owen, his fellow casualty in battle. But with each the truncation of a creative career has left behind the most tantalising of questions over just how they would have progressed beyond their still limited genres. What can be said of Butterworth, as far as his work developed, is that the songs and small-scale orchestral pieces by which essentially he remains known show both the most telling ear for musical detail and refined colour, plus, especially in the songs, a virtuoso (Mozartian?) economy of means. One’s fingers are rarely in a dither at the keyboard—but combining touch and imagination is a different matter, making far more taxing demands. Some have found the simplicity artificial and over-innocent, but surely more to the point is that exceptional performances may be needed to lift some of the songs off the page. Take Loveliest of trees, one of the great twentieth-century English songs. On the face of it, the writing looks so spare, and yet what orchestral colour—and sheer rapture—can be conjured up in the right hands, by the right voice. The fact that Butterworth’s Six Songs from A Shropshire Lad are far better known than Bredon Hill and other songs from A Shropshire Lad (written in 1911 and 1912 respectively) surely has little to do with the relative musical merits of each set. For a start, the Bredon Hill group includes a song every bit the equal of Loveliest of trees in On the idle hill of summer. Butterworth brought to his Housman settings the experience of a substantial amount of folksong collecting at source, from Yorkshire down to Hampshire, Hereford to Norfolk. His friend Vaughan Williams considered that this study of folk-song made him as a composer. To that point, Greats at Oxford, the start of a teaching career at Radley and even studies at the Royal College of Music had left Butterworth unfulfilled. When I was one-and-twenty is the only one of the Butterworth settings actually to use folk-song, although not alone in having that feel. Bredon Hill (In summertime on Bredon) sets one poem which highlights the point that A Shropshire Lad depicts a mythical, rather than an actual, landscape. Bredon Hill is in fact in Worcestershire—a great, glorious lump of a hill that has far more to offer in the way of views, nooks and crannies than its more lauded near neighbours, the Malverns. Probably no composer has so far set more of Housman’s poetry than C W Orr (1893–1976). Few writers of English art song have been more unjustly neglected. A West Country man, he was born in Cheltenham shortly after his father (a captain in the Indian army) died of tuberculosis. Orr became besotted with Housman’s poetry just after the Great War, during which he was unable actually to fight—though he joined up—on medical grounds. He made research visits to Shropshire, photographing significant sites—and even managed to get himself smuggled into one of Housman’s lectures (as Kennedy Professor of Latin) at Cambridge. Coming from a moneyed background, Orr could literally afford to follow his personal musical inclinations, and in fact was writing many of his songs at a time when it was especially difficult to find publishers interested in waging war against the declining popularity of the musical form. Amusingly—perhaps!—Housman refused Orr’s appeal to be allowed to translate A Shropshire Lad into German so that he would have a better chance of bringing his songs into wider circulation. Orr’s thirty-five songs represent almost his entire output as a composer. The enthusiasm for the voice was kindled in part by an early passion for the artistry of Elena Gerhardt whom he heard sing in Cheltenham. This fanned an interest in Schubert, Brahms and Schumann, while Ernest Newman’s book on Hugo Wolf introduced Orr to the composer who was to colour so much of his own work. When I watch the living meet would be embarrassingly Wolfian were it not for the sheer quality of the song. The other particular influence on his song-writing was Delius. Orr plucked up the courage to introduce himself to the composer at a London restaurant in 1915 and a close friendship then developed. Delius proved more of an encouragement for Orr to plug away at his early compositions than the time he spent at the Guildhall School of Music in London. The Housman settings featured in this recording come from the years before and after 1930, when Orr resettled back in Gloucestershire with his wife on the advice of a doctor, to try to keep nagging tuberculosis at bay. The Cycle of Seven Songs from A Shropshire Lad (here represented by When I watch the living meet, Hughley Steeple) was written between 1927 and 1931 and originally had to be published by Orr himself. This time of year, from Five Songs from A Shropshire Lad, dates from 1927. Into my heart an air that kills (1935) and Oh see how thick the goldcup flowers (1939) are in Three Songs from A Shropshire Lad, which was dedicated to Gerald Moore. The phrase ‘That is the land of lost content, | I see it shining plain’ from Into my heart takes on the quality of the emotional centre of this whole recording project. The Isle of Portland (1940) is dedicated to the baritone Robert Rowell who championed Orr’s songs in his concerts. Portland, a peninsula in Dorset, is known for its stone and prison. Towards the end of his life, Orr grew increasingly bitter at the neglect of his songs, not least—as he saw it—by the BBC. He had no monopoly on such resentment at lack of recognition, but his case was and remains particularly strong. That great enthusiast for British music Christopher Palmer (who died, tragically young at the age of 48, as these notes were being written) described Orr as ‘one of the finest British song composers of the century’. The nut-brown richnesses and harmonic complexities of the Housman settings of John Ireland (1879–1962) may at first hearing seem out of place in close proximity to, say, the folk-song spareness of the Butterworth settings. But there is a case for arguing that in terms of essential musical mood, Ireland comes as close as anyone to the mind of the poet. All but two of his songs recorded here are from the cycle The Land of Lost Content, dating from 1921—intended for first performance by Gervase Elwes, who died before it could take place. The chosen title is, one assumes, significant given that the Housman poem from which the line comes—Into my heart an air that kills—wasn’t set by Ireland. His content was lost in childhood, with the early deaths of both parents. Emotional insecurity and a sense of inferiority were fault lines running through his life, bringing the longing for some kind of safe haven. The ‘horizon’ he felt ‘romantic’ about, to conscript Housman’s words, was to the south of his London home—Sussex where he was born and the Channel Islands where his retirement was truncated by the German invasion in 1940. His marriage in 1927 to a pupil, Dorothy Philips—intended as a well-meaning gesture to protect her from an overbearing father—was so disastrous it didn’t even last out the wedding night and was soon annulled. Ireland always insisted on being described in Who’s Who as ‘bachelor’. The ingredients, then, of an emotional profile that was bound to find resonances in A Shropshire Lad; and so it proves. The nostalgic sense of impermanence in The Lent Lily; the acidity of ‘Goal and Wicket’, bitter-sweetness in ‘The Vain Desire’; the insecure robustness of ‘The Encounter’, with its homosexual overtones; and resignation in ‘Epilogue’. (All the titles bar The Lent Lily are Ireland’s own.) And don’t be deceived by the great rolling tune of the ‘free-standing’ song ‘The Heart’s Desire’ (c1917), by no means rooted in ‘pastoral calm’ as one commentator decided. ‘Hawthorn Time’ dates from 1919. E J Moeran (1894–1950) was another composer deeply influenced by folk-song—in his case, that of his native East Anglia in particular. Severely wounded in the Great War, he survived to study composition with John Ireland, whose presence, along with Delius and others, hovers over much of his work. Moeran was of Irish stock and deeply treasured the fact, but his move to the Cotswolds in the 1930s, paralleling that of Orr, must also have fed his imagination. Until the recent revival of interest in Moeran’s larger-scale music on CD (notably the impressive G minor Symphony) his songs and choral works were perhaps the best-known area of his work. Four Housman settings are among his earliest work—unpublished songs dating from 1916. In all, he drew on the poet on twelve occasions. 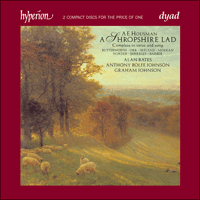 The two songs featured in this recording are independent of his one published Housman cycle, Ludlow Town. Oh fair enough are sky and plain dates from some time in the mid to late forties. Far in a western brookland was written in the mid-twenties during the time Moeran shared a house at Eynsford in Kent with Philip Heseltine, alias the composer Peter Warlock. The hedonistic lifestyle at Eynsford inspired by Heseltine, which attracted copious numbers of beer-swilling guests from the arts world, brought the previously prolific Moeran almost to a compositional standstill. Far in a western brookland is a rare product of the period. Mervyn Horder, alias the Second Baron of Ashford, was born in 1910, the son of a doctor who was to be ennobled for ministrations to a series of British monarchs. As a schoolboy at Winchester he was taught by the composer George Dyson. After studying Classics at Trinity College, Cambridge, he went on to war service in India and the Far East. From 1946 to 1970 he was chairman of the Gerald Duckworth publishing house. A Who’s Who entry lists recreations as ‘music, idling’, but the musical interest has never, it appears, been exactly idle. Horder has edited carol books and composed numerous songs to words by the likes of Betjeman, Shakespeare, W H Auden, Dorothy Parker and Robert Herrick. White in the moon the long road lies, written in the early 1980s, is one of several Housman settings exemplifying Horder’s stated watchwords: ‘I still take the old-fashioned view that music should not puzzle but please and is probably better if it pleases instantly, at first hearing.’ White in the moon, one might suggest, adds a touching poignancy to that pleasure. Horder is currently at work on a Burns cycle to mark the bicentenary of the poet’s death in 1996. The two Housman settings by Lennox Berkeley (1903–1989) included here date from the early forties, when Berkeley was finding his feet as a composer. The songs reflect his attempts to come to terms with the break-up of his relationship with Benjamin Britten. For a period the two had shared the latter’s home, the Old Mill in Snape. The relationship was broken by Britten who in 1939 left with Peter Pears for the United States where they spent the first stages of the war. Considered against the background of Berkeley’s apparently considerable distress at the time, the settings Because I liked you better and He would not stay for me make poignant listening, paralleling Housman’s loss of his relationship with Moses Jackson—again involving a separation of several thousand miles. Berkeley was to marry in 1946. Graham Johnson chose to position these two non-Shropshire Lad songs where they stand in order to maximise the impact of the preceding poem, Shot? so quick, so clean an ending?. This is Housman’s commentary on an 1895 news story of a young naval cadet at Greenwich who shot himself rather than succumb to what he felt were ‘sinful’ homosexual urges. When the Curtis Institute of Music in Philadelphia opened its doors in October 1924, the fourteen-year-old Samuel Barber (1910–1981) was reportedly the second person into the building. A voracious reader, his taste in poetry expanded in his Curtis years in many directions, not least towards British poets, among them W H Davies, Fiona MacLeod and Housman, whose A Shropshire Lad had been available in the USA almost from its first publication. With rue my heart is laden was composed in 1928, with Barber still only at the tender age of eighteen. It forms part of his three-song Opus 2 which lay unpublished until 1936, the year after being premiered by the American singer Rose Bampton at, of all places, a private London concert in the home of Viscount and Viscountess Astor. With rue my heart is laden is dedicated to Gama Gilbert, a close friend of Barber at Curtis. A talented violinist, Gilbert in fact became a leading critic with The New York Times. The mood of poem and setting uncannily foreshadowed his early death at the age of forty.